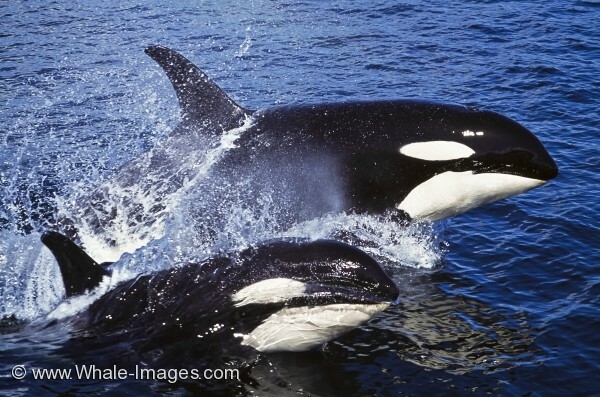 Sea Animals - Northern Resident Orca Whales (Killer Whales) off the Vancouver Island coastline, British Columbia, Canada. Two female orca whales are catching a ride with one of the local whale watching boats in Johnstone Strait in British Columbia, western Canada. It's great to see two sea animals surfing side by side especially a mother (Blinkhorn, A54) with her baby (Cedar, A 75). This is a unique sight, first of all to see surfing killer whales, and then to to have two killer whales surfing so close to one another as they travel at 20 knots (or nearly 40 kilometres an hour). These sea animals display a great deal of power and strength as they surf along side the whale watching vessel. Make sure to see this outstanding picture selection of sea animals.